Decorate the bedroom for Christmas. Decorating the house for Christmas has always been a big deal in my family. Thanksgiving dinner was often served in a room decorated with Christmas ornaments. I like to carry holiday decorating into all the rooms, including the bedrooms and bathrooms. No matter how small the room, there is usually some way to make a Christmas statement. 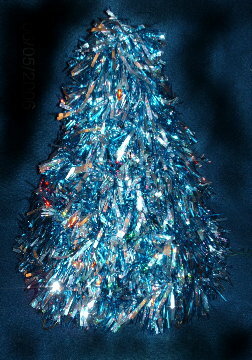 Probably our favorite Christmas items are tabletop trees about a foot high, lighted and decorated. We have about a dozen now and my daughter and I make a few more trees every year. Some are decorated with mini ornaments, some are decorated with ribbons and beads, and one of my favorites is decorated with gold ribbon roses and peacock feathers. The interesting thing about these trees is that they are made from wire coat hangers, although you can't tell that by looking at them, can you? We place trees all over the house; I really like the look of all the little trees lit up, and they can take the place of bedside lamps- as long as I don't try to read. The light is a bit too dim for me, although my daughter reads by the light without a problem. Many people save Christmas cards from year to year. Last year my daughter (her name is Erishae, by the way) cut out the backs of the cards into the shape of a slipper sole and then cut the pretty card fronts into the shape of the top part of a slipper- the part the toes slide into. She used colored yarn to whip-stitch the pieces together and filled each little slipper with candy or small gifts for friends. They turned out quite special, and our friends have a home-made ornament to remember us by. As a side note, she used her son's foot as the pattern for the slipper sole, so each ornament is a memory of her son at age 4 (his name is Nazareth- how perfect is that for Christmas?). How about holiday pillows on the bed with a matching or co-ordinating throw? Holiday bedding is easy to find and isn't necessarily expensive. If you're not much into prints, you could use solid colors- a green comforter, red pillows, white sheets. Or maybe red and green plaids? More easy touches- fill a glass bowl with something Christmas-y, like shiny balls or a tangle of tinsel. Or pile pine cones in a basket. Or buy wire-edged ribbon in any color or colors that look festive to you and tie bows on everything that takes your fancy. If the only available space is on the wall, pick a perfect wreath. Artificial wreathes or live wreathes, wreathes from metal or foam or wood or paper, wreathes from tiny to enormous, decorated with flowers or fruit or miniature toys or little wrapped presents. The idea is to find something that makes you happy and says "Merry Christmas" to your spirit. Yes! Let me know when the book is ready. Don't worry. I won't share your information with anyone and I won't bother you with email. I'll just let you know when the Tree e-book is ready.